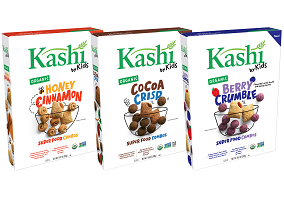 Kellogg, the US cereal and snacks giant, has announced the first line under its Kashi organic brand that is specifically targeted at children. Named Kashi By Kids, the new cereal line is said to feature “tasty superfoods ingredients + fun shapes + mighty plant based nutrition” and is described as being co-created “with passionate Gen Z leaders who inspire others to make a difference in the world”. The organic cereal range, which comes in the varieties Berry Crumble, Honey Cinnamon and Cocoa Crisp, features “cool shapes like swirls and filled pillows, great tastes like honey and berry, and superfood ingredients like chickpeas and red lentils”. Each variety is said to contain at least 18g of whole grains, 3g fibre and 8g of sugar or less per serving. Commenting on the launch, Jeanne Wilson, associate director of brand marketing at Kashi said: “Phil and Gayle Tauber founded Kashi more than 30 years ago after recognizing the need to transform the American diet and show people the good that real food can do. At Kashi, we strive to maintain that inventor’s mindset and set out to do the same in our first kids’ products, channeling the creativity and knowledge of kids themselves and combining unexpected ingredients like red lentils and purple corn with nature’s delicious flavors such as honey and cinnamon. The end result is an awesome line of organic cereals with superfood ingredients that parents and kids can feel good about”.